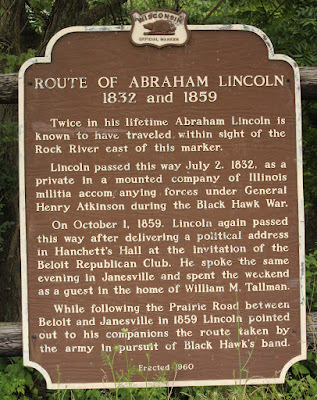 Twice in his lifetime Abraham Lincoln is known to have traveled within sight of the Rock River east of this marker. Lincoln passed this way July 2, 1832, as a private in a mounted company of Illinois militia accompanying forces under General Henry Atkinson during the Black Hawk War. On October 1, 1859, Lincoln again passed this way after delivering a political address in Hanchett's Hall at the invitation of the Beloit Republican Club. He spoke the same evening in Janesville and spent the weekend as a guest in the home of William M. Tallman. 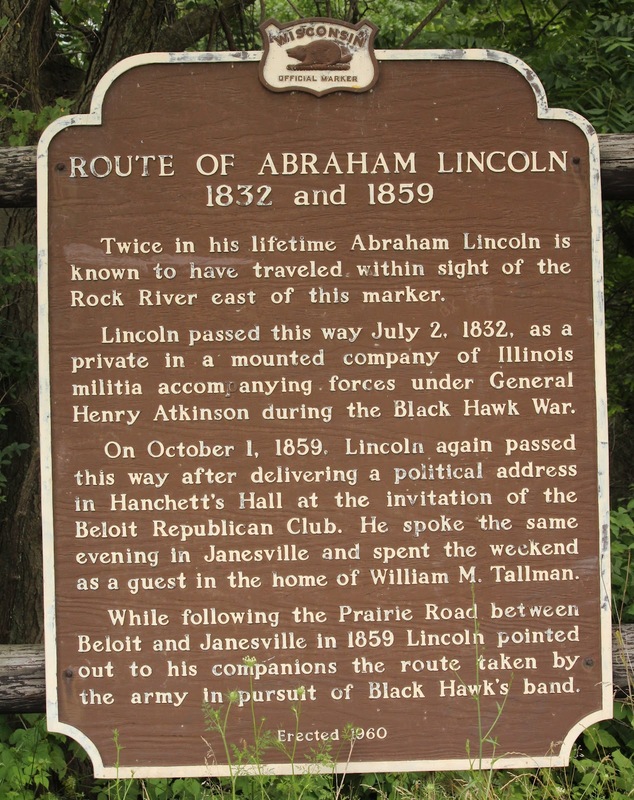 While following the Prairie Road between Beloit and Janesville in 1859 Lincoln pointed out to his companions the route taken by the army in pursuit of Black Hawk's band. The marker is located at a highway pull-off on southbound North Riverside Drive / U.S. Highway 51, south of its intersection with West Happy Hollow Road, across from the North Riverside Drive entrance to Blackhawk Technical College, Janesville, Wisconsin 53546. Use the "black hawk war" label below to view all related posts on this website; there are many.